"Everyone knew that being dead could put you in a terrible mood." It is believed that death is not the end of life, but the continuation of life in a parallel world. Once a year, on the Catholic Holidays of All Saints Day and All Souls Day, on November 1 and 2, the dead are carried by the winds and returned to their former homes. The spirits need help finding their way home and they must be made welcome. The door from the underworld, to the world of the living, is made with an arch of marigold flowers. The spirits arrive hungry, so their favorite foods are offered. They also arrive very thirsty and far too sober for the celebrations. 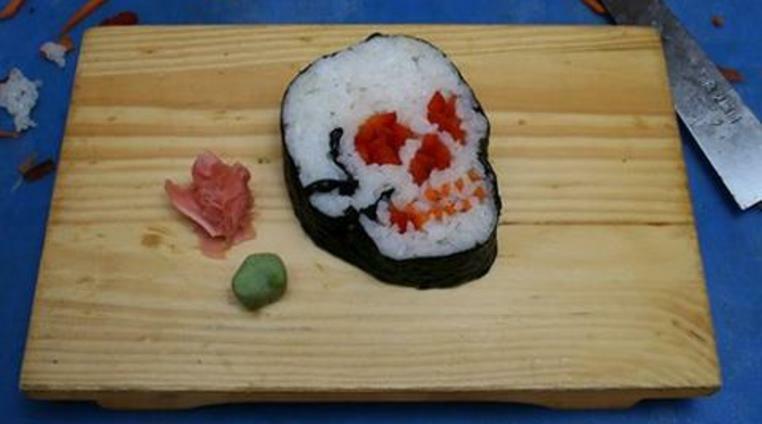 They want candy, made in their image, skulls, and crave the bread of the dead. They must be cheered-up. In death, as she was in life, if mama is not happy, no one is happy. 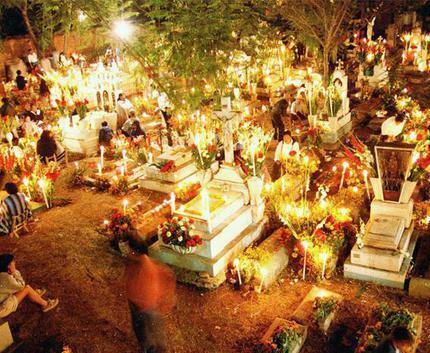 All over Mexico, the last week of October brings cleaning and pruning to the cemeteries, where loved ones will return. Everything must be perfect. Everything must be beautiful. In Morelia, walk the Calzada de Fray Antonio, the “pedestrians-only” street, and see the ofrendas, alters or shines. Stroll through the government buildings, hotels and stores to see their ofrendas. It would be worth a trip to Morelia’s cemetery, on the Periferico. Don’t miss the special Day of the Dead displays at the Candy Museum, El Museo del Dulce, near the historical center of Morelia. The traditional Purepecha celebrations are the most unique and beautiful in the world, because in Michoacan, around Lake Patzcuaro, Noche de Muertos, or Night of the Dead is celebrated. 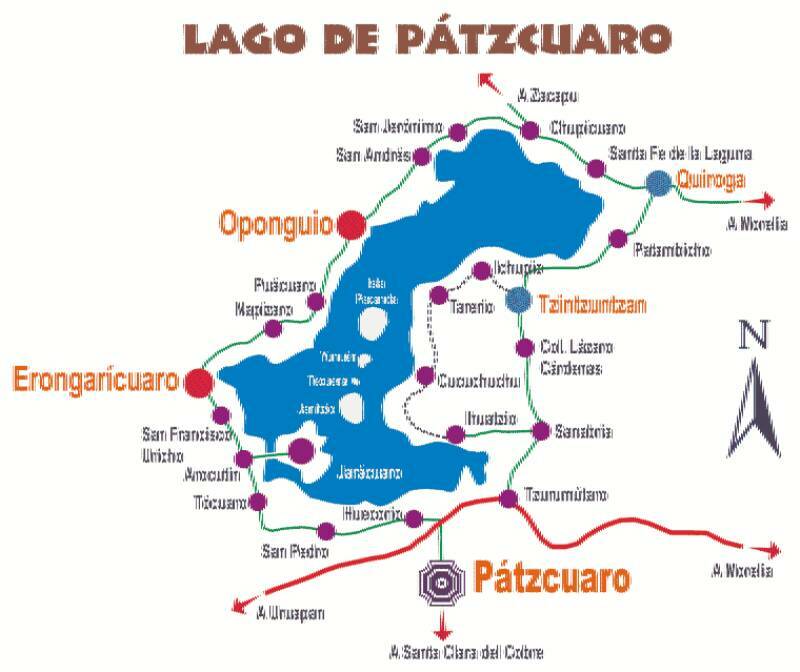 Lake Patzcuaro is known for its nighttime cemeteries, shrouded in marigolds and illuminated by thousands of candles.As you travel around the Lake, each village, town or city in Michoacan has its own celebration, with parades, markets, concerts, exhibitions, ceremonies and dances. Capula, high in the mountains around Lake Patzcuaro, is the artistic center for Dia de Muertos. Two Saturdays before Muertos, is the opening of their annual Catrina Festival and La Feria Artesanal de la Catrina. Watch the crowning of La Reina de Muerto, the Queen of the Dead, when the Capula beauties compete in full Catrina makeup and in the famous Catrina gowns. In Patzcuaro visit the Cristo graveyard for a non-tourist experience. The famous Day of the Dead Artisan Market begins the Saturday before Muertos at the Plaza Grande. Arrive early to get the best pieces of Ocumicho fantasy ceramic sculpture. If you see something you like, get it, since it will probably not be there when you return. See, smell and buy Day of the Dead flowers at the Marigold Market, located on the south side of the Basílica on Calle Serrato. Enjoy the intoxicating aroma from the glorious mounds of cempazuchitl (marigolds) and maroon-colored mota de obispo (cockscomb). 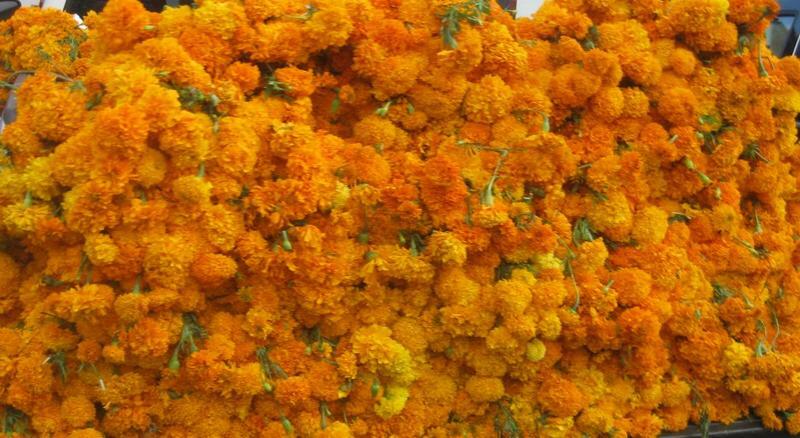 Carry arm-loads of marigolds back to your home or hotel. The library, Biblioteca Gertrudis Bocanegra, on Plaza Chica, has several exhibits for Day of the Dead. The Noche de Muertos Catrina exhibit and sale of the famous figurines from Capula opens in the evening a few days before Muertos. Also at the Library is the exhibit of the altars and offerings for Night of the Dead that are traditional in the Lake Patzcuaro region, opening November 1. For another side of Dia de Muertos, visit the Templo de Santa Muerte, the Temple to the Saint of Death. About four miles west of Patzcuaro, on the Lake, in Santa Ana Chapitiro, is the Temple for Santa Muerte, a sacred figure venerated in Mexico. Santa Muerte generally appears as a skeletal figure, clad in a long robe and carrying one or more objects, usually a scythe and a globe. The saint can be seen in the celebrations of the Day of the Dead. According to Wikipedia, the use of skeletons is to remind people of their mortality. The Temple is open to the public and visitors are gladly welcome. Photos are cheerfully permitted, but it is a Temple, so dress and act accordingly. Next to the Temple is Abarrotes Las Carolinas where replicas of Santa Muerte are sold. For those who want to really enjoy the tradition and beauty of Night of the Dead, November 1, arrive in Tzintzuntzan late afternoon and visit the artisan fair to see local pottery and crafts. Then go to the cemetery to view the ofrendas and decorated graves. The winds pick-up as the dead arrive. Watch the magic as the sun goes down and the light of the candles takes over. If you miss the Tzintzuntzan cemetery that night, don’t worry, the next few days are less crowded and it is easier to see the incredible ofrendas. 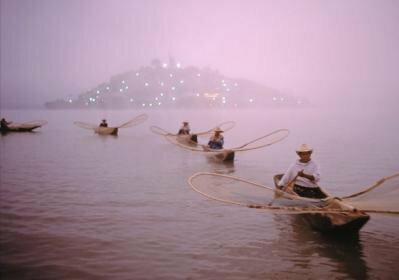 Janitzio Island, in the middle of Lake Patzcuaro, is the site of one of Mexico's most celebrated Night of the Dead observances. Legend has it that the 'veil between darkness and light' is the thinnest around this Island. Each year on Nov. 1, islanders and their neighbors take to their boats to enact a candlelight ritual, the flames reflected in the water, the boats laden with flowers and the boaters chanting. Truly a memorable experience. All around Lake Patzcuaro, in any of the villages, from Erongaricuaro to Tzintzuntzan, there will be breathtaking Noche de Muertos celebrations. If you attend, be ready to celebrate and to cheer-up the grumpy dead. But be prepared! You never know who might arrive on the next gust of wind. The Day of the Dead celebrations in Mexico can be traced back to the indigenous peoples such as the Olmec, Zapotec, Mixtec, Mexican, Aztec, Maya, P'urhépecha, and Totonac. Rituals celebrating the deaths of ancestors have been observed by these civilizations perhaps for as long as 2500–3000 years. 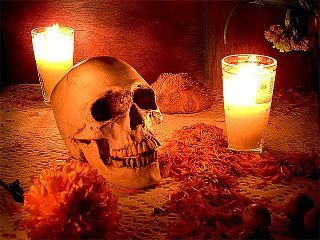 In the pre-Hispanic era, it was common to keep skulls as trophies and display them during the rituals to symbolize death and rebirth. In most regions of Mexico, November 1st honors deceased children and infants where as deceased adults are honored on November 2nd. 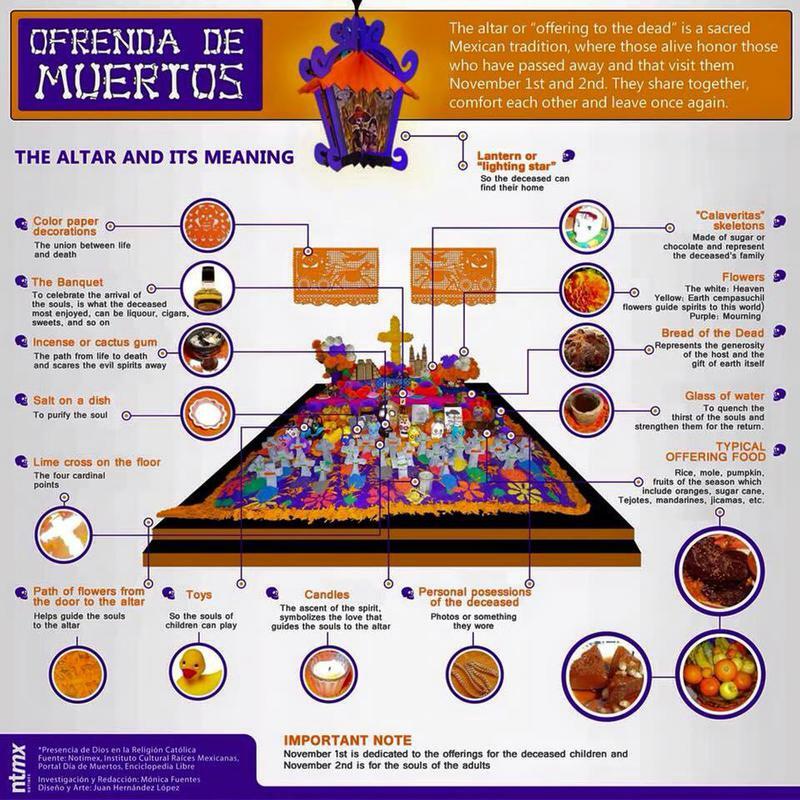 This is indicated by generally referring to November 1st mainly as "Día de los Inocentes" (Day of the Innocents) but also as "Día de los Angelitos" (Day of the Little Angels) and November 2nd as "Día de los Muertos" or "Día de los Difuntos" (Day of the Dead). Many people believe that during the Day of the Dead, it is easier for the souls of the departed to visit the living. People will go to cemeteries to communicate with the souls of the departed, and will build private altars, containing the favorite foods and beverages, and photos and memorabilia, of the departed. The intent is to encourage visits by the souls, so that the souls will hear the prayers and the comments of the living directed to them. Celebrations can take a humorous tone, as celebrants remember funny events and anecdotes about the departed. Plans for the festival are made throughout the year, including gathering the goods to be offered to the dead. 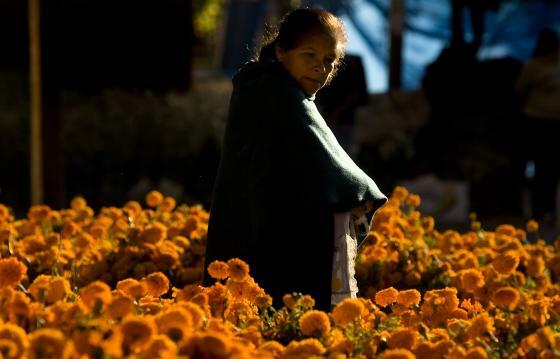 During the period of November 1 and November 2, families usually clean and decorate graves; most visit the cemeteries where their loved ones are buried and decorate their graves with ofrendas, or offerings, which often include orange marigolds called "cempasúchitl" (originally named cempoalxochitl, Nahuatl for "twenty (i.e., many) flowers"). In modern Mexico this name is often replaced with the term "Flor de Muerto" ("Flower of the Dead"). These flowers are thought to attract souls of the dead to the offerings. 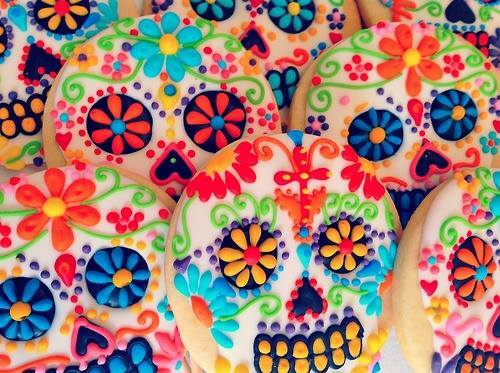 Day of the Dead, Dia de Muertos, is a Mexican holiday celebrated throughout the world. 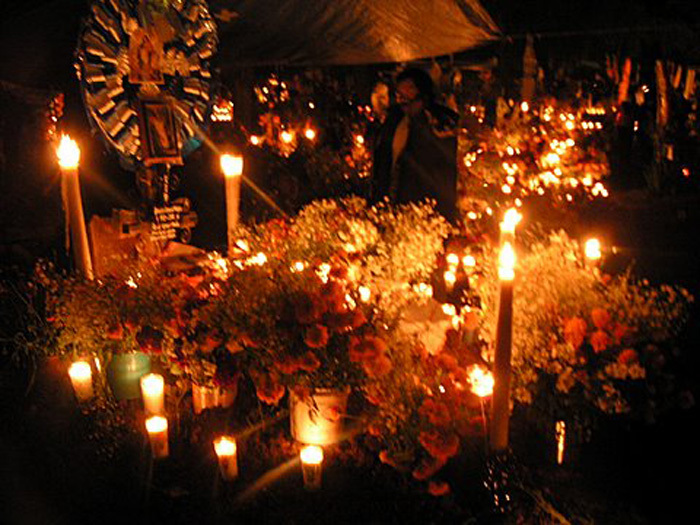 Noche de Muerto, Night of the Dead is the celebrated only in the Lake Patzcuaro area. 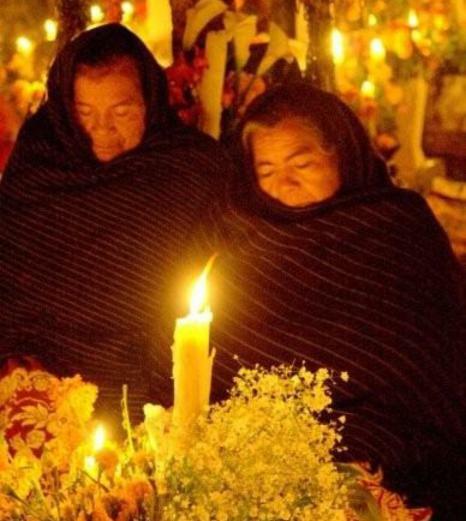 In cemeteries around Lake Patzcuaro, homage to the dead begins at sunset on November 1 and continues through the next morning, with all-night candlelight vigils and celebrations. If you can not visit at night, visit during the week for a better view of the alters and ofrendas. Night of the Dead coincides with the pre-Hispanic harvest festivals and the Colonial American Hunters Full Moon, where abundant food is shared to everyone, including the dead. Friends and family gather to pray for and remember those who have died. The celebration takes place in connection with the Catholic holidays on November 1, All Saints Day and November 2, All Souls Day. Traditions connected with the holiday include visiting commentaries at night and building private altars at home to honor the deceased. Scholars trace the origins of this modern Mexican holiday to indigenous Purepecha observances dating back hundreds of years and to an Aztec festival dedicated to the goddess Mictecacihuatl. This Mexican holiday has spread throughout the world, especially in the United States. At sunset around Lake Patzcuaro on November 1, do not be surprised if the winds pick-up, as spirits are blown-back to their homes on earth. Other spirits are drawn-back by the aroma of the marigolds, the promise of celebrations, the sugar skulls and the bread of the dead. All of which we enjoy, also. Join us as we welcome and cheer-up the dead. Cristina, of Mexico Cooks! writes: "Several weeks ago Francisco (a friend from Michoacán) and I were talking about differences in cultural attitudes among citizens of Canada, the United States, and Mexico. We ended by discussing the Noche de Muertos (Night of the Dead) customs here in Mexico. Francisco told me that before the Spanish conquerors, Mesoamerican natives considered death to just be a simple step toward a new life. Life was a circle: time before birth, time here on earth, time after death constituted a continuum with no end, like a golden ring on a finger. Communication between the spirit life of the living and the dead was an ordinary experience. 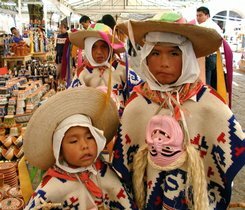 With the arrival of the Spanish and their Christian beliefs, the indigenous people were taught new ideas. Thoughts of death produced terror: in the final judgment, the just would receive their reward and sinners their punishment. The difficulty lay in not being counted among the sinners. The original pre-Hispanic remembrance celebration of the dead took place during the Aztec calendar month dedicated to Mictecacihuatl, the goddess of the dead. That month of the Aztec calendar corresponds to present-day July and the beginning of August. Post-conquest Spanish priests moved the celebration to coincide with the eve of All Souls Day, which falls on November 2. It was a useless attempt to change what the Spaniards regarded as a profane New World festivity of mumbo-jumbo into a Christian solemn occasion. The modern day result is a festival characterized by a mix of Aztec and Catholic ritual—a purely Mexican event. In the late 1800's, José Guadalupe Posada popularized the notion of death partying through life. Today in Mexico, death is played with, made fun of, and partied with. We throw our arms around it in a wickedly sardonic embrace and escape its return embrace with a side-step, a wink, and a joke. Noche de Muertos (Night of the Dead) is celebrated during the chilly night of November 1, ending in the misty dawn hours of November 2. For Mexicans, the celebration represents something more than maudlin veneration of their dead relatives. The celebrations of Memorial Day in the United States or Remembrance Day in Canada are all too frequently devoted to a fleeting moment's thought of those who have gone before, with the rest of the day passed in picnicking and the anticipation of the soon-to-arrive summer holidays. 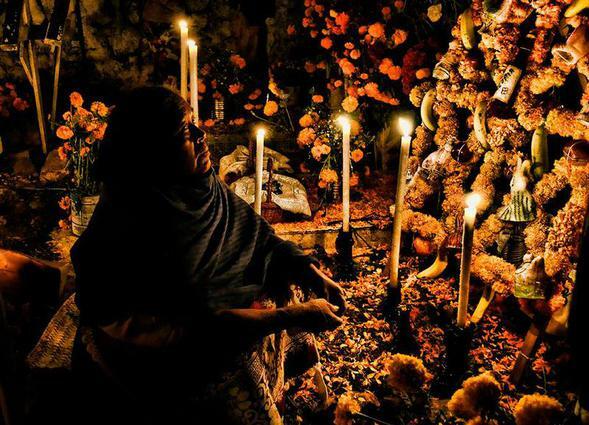 In many parts of Mexico, the living spend the entire night in communion with the faithful departed, telling stories, swapping jokes, wiping away a tear or two. The idea that death is found in the midst of life (and life in the midst of death) has given rise to different manifestations of extraordinary and original expressions of popular art in Mexico. 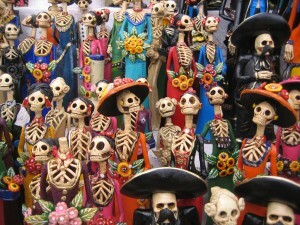 Among those are the custom of making and decorating sugar skulls (often with the name of a friend or relative written across the forehead), pan de muertos (bread of the dead), drawings in which much fun is poked at death, and calaveras, verses in which living and dead personalities—usually celebrities in the arts, sciences and especially in politics—are skewered by their own most glaring traits and defects. We wait impatiently for the newspapers to give us the most hilarious of the annual poems. Traditionally, ofrendas (personalized altars) are prepared in the home in honor of one or more deceased family members. The altar is prepared with the deceased person's favorite foods, photographs, and symbolic flowers. Traditions vary from community to community. In Michoacán, the altar may be decorated with special breads and bananas. In Oaxaca, other foods and fruits are used. It's most common to decorate an altar with hot pink and deep purple papel picado (cut tissue paper) as well as with foods, flowers, and personal objects important to the deceased. 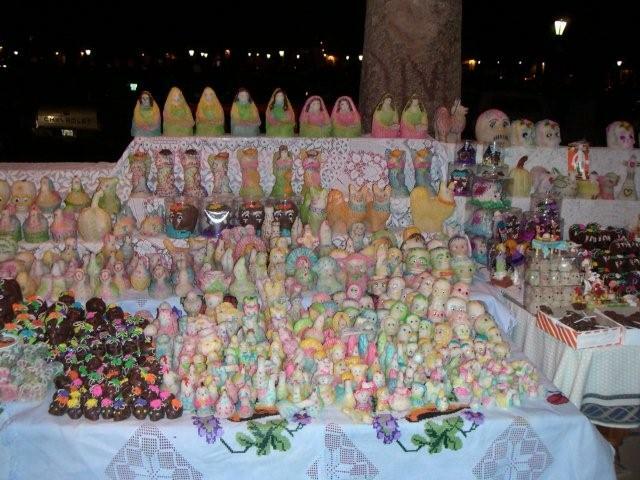 In many places, public ofrendas are set up in the town square, the local Casa de la Cultura, or in shops. Many public altars honor national heroes, personalities from the arts, and little-known friends or well-known public figures. We use bottles of beer or tequila or another of the dead person's favorite drinks, a packet of cigarettes or a cigar, a prayer card featuring the deceased's name-saint and another of the apparition of the Virgin to whom the deceased was particularly devoted. 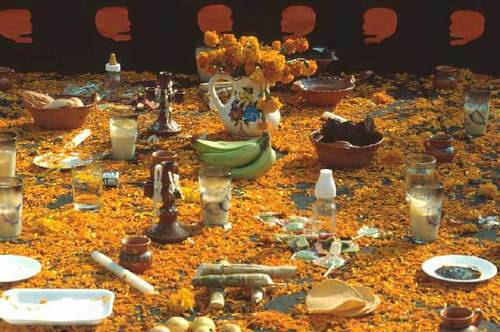 Foods on the altar can include a dish filled with mole poblano or other festive food that the deceased enjoyed in life, a pot of frijoles de la olla (freshly cooked beans), platters of tamales, pan dulce (sweet bread), and piles of newly harvested corn, pears, oranges, limes, and any other bounty from the family's fields or garden. The purpose of the offerings is not to flatter and honor to the dead, but rather to share the joy and power of the year's abundance with him or her. Dolls made of cartón (cardboard) are usually sold at special markets specifically devoted to Day of the Dead items. The cempasúchil (gold flowers) and the cordón del obispo (bishop's belt, the magenta flowers) adorn most graves and ofrendas (altars honoring the deceased). The fresh flower most commonly used everywhere in Mexico to decorate both home altars and at the cemetery is the cempasúchil, a type of marigold. According to my friend Francisco, the cempasúchil represents reverence for the dead. Wild mountain orchids, in abundant bloom at this time of year and cut especially for the Noche de Muertos, signify reverence toward God. Dahlias, the floral symbol of Mexico, are also used profusely on both home altars and in cemeteries. 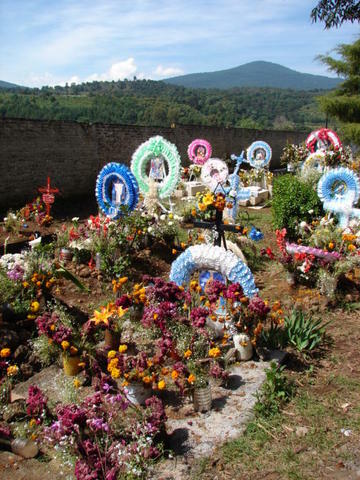 In addition, huge standing coronas (wreaths) of colorful ribbons and artificial flowers adorned with lithographs of saints, various manifestations of the Virgin Mary, or Jesus are used more and more frequently in Mexican cemeteries. 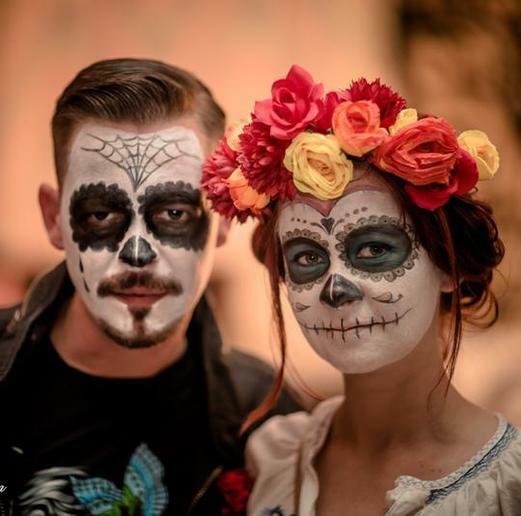 Because the social atmosphere of this celebration is so warm and so colorful—and due to the abundance of food, drink, and good company—the commemoration of Noche de Muertos is much loved by the majority of those who observe it. In spite of the openly fatalistic attitude exhibited by all participants, the celebration is filled with life and is a social ritual of the highest importance. Recognition of the cycle of life and death reminds everyone of his or her mortality. Catrines, in this case clay figures of well-dressed skeletons, represent the vanity of life and the inescapable reality of death. On the day of November 1 (and frequently for several days before) families all over Mexico go to the cemetery to clean and decorate the graves of their loved ones. With brooms, shears, hoes, buckets, metal scrapers and paint, the living set to work to do what needs to be done to leave the grave site spotless. Is the iron fence around the plot rusty? Scrape it and paint it till it looks brand new. Are there overgrown weeds or bushes? Chop them out, cut them back. Have dead leaves and grass collected at the headstone? Now is the time to sweep them all out. There is usually much lamenting that the grave site has been allowed to deteriorate so much throughout the year—this year we won't let that happen again, will we? Sugar skulls are a Día de los Muertos (Day of the Dead) tradition in Mexico. Buy one and have the name of your friend written on the forehead with stiff sugary icing. Your friend will be delighted with the gift. In many places, November 1 is celebrated as the Day of the Little Angels—the little children who have died. In Michoacán on the Day of the Little Angels, the baptismal godparents are responsible for bringing a wooden frame for the flowers, for bringing the cempasúchil and the wild orchids. 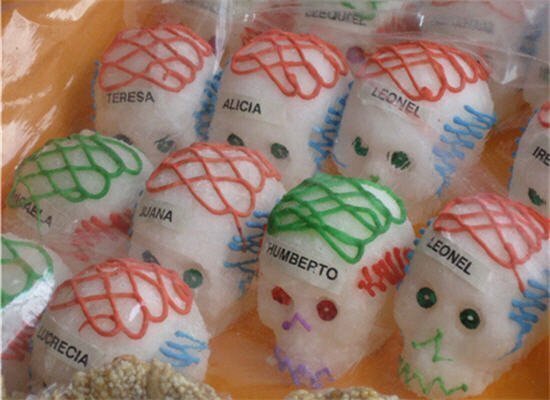 The godparents bring sugar angels or animals similar to the sugar skulls. They may also bring new clothing for the dead child, and a new toy or two. At the parents' home, preparation of food and drink is underway so that family and friends may be served. Cohetes (booming sky rockets) announce that the procession, singing and praying, is proceeding to the cemetery. In the late evening of November 1, girls and women arrive at the graves of adults with baskets and bundles and huge clay casseroles filled with the favorite foods of the deceased. A bottle or two of brandy or tequila shows up under someone's arm. Someone else brings a radio and wires it up to play. 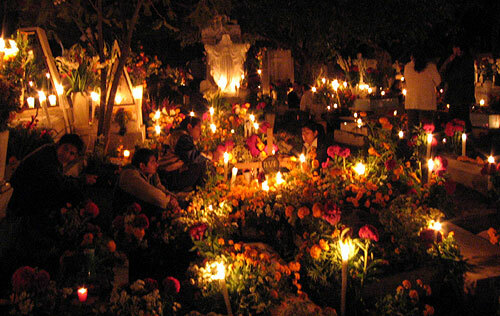 Although the traditional observance of Noche de Muertos calls for a banquet either at the cemetery or at home during the pre-dawn hours of November 2, urban families in Mexico may simply observe the Day of the Dead rather than spend the night in the cemetery. Their observance is frequently limited to a special family dinner which includes pan de muertos (bread of the dead). In some areas of the country, it's considered good luck to be the person who bites down on the toy plastic skeleton hidden by the bakery in each round loaf. Friends and members of the family give one another little gifts which can include tiny clay skeletons dressed in clothing or set in scenes which represent the occupations or personality characteristics of the receiver. The gift that's most appreciated is a calavera (sugar skull), decorated with sugar flowers, sparkling sequins, and the name of the recipient written in frosting across the cranium. The pre-Hispanic concept of death as an energy link, as a germ of life, may very well explain how the skull came to be a symbol of death. That symbol has been recreated and assimilated in all aspects of Mexican life. The word calavera can also refer to a person whose existence is dedicated to pleasure—someone who does not take life seriously. The mocking poems of this season, the caricatures drawn with piercingly funny accuracy, the sugar skulls joyfully eaten by the person whose name they carry: all of these are an echo of pre-Hispanic thought, inherited by Mexico today. 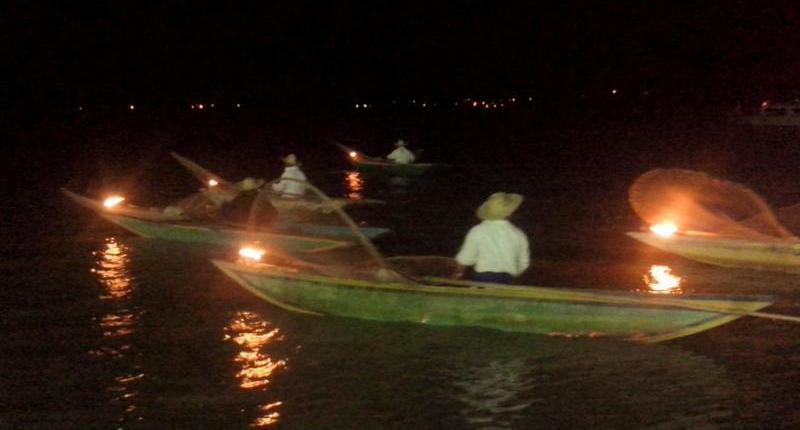 Midnight Candle Parade of Boats on the Isle de Janitzio! Dia de Muertos, Day of the Dead, is November 2.
lasting until the morning of November 2. 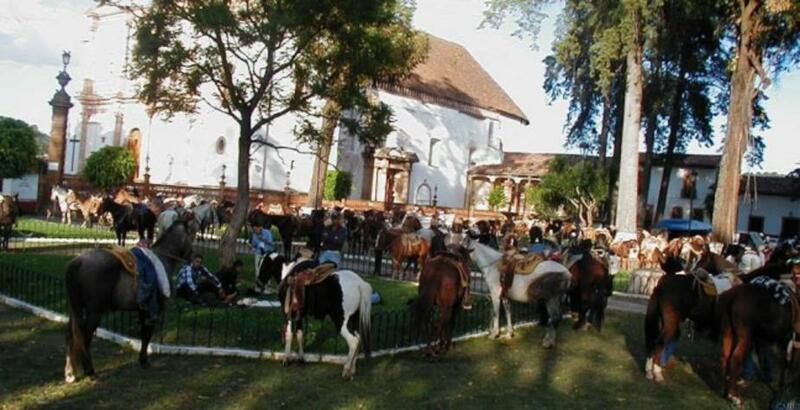 On Monday, October 24th (this pilgrimage on horseback used to be held on the 1st of November) the cavalcade will depart at 6 a.m. from the Cathedral in Morelia making their way to Patzcuaro. Along the way there will be many riders that will join in to accompany them. Our group - Los Hombres de a Caballo Señor Santiago de Patzcuaro - will leave around 2:30 to ride up to el Zapote to meet them and continue on until we arrive in Patzcuaro between 4:30 and 5:15. Mass is at 6 p.m. so we will be there in enough time to cool down our horses and tie them up (or trailer them) before mass begins. As in the past between 800 and 1000 riders are expected to attend. You are most welcome to see this dedicated group of riders who will be arriving on Serrato which is the wide street to the side of the Basilica ... and stay to attend mass at 6 p.m. if you like. This is the 31st year this pilgrimage has been held. The founder of this pilgrimage wanted to show his gratitude to the Virgin of Health for helping his son recover from a serious illness. The father has since passed away and his family continues this tradition. It has been mistakenly referred to as the blessing of the horses or that it had something to do with Day of the Dead celebrations but neither of those are true.